BILLINGS, Mont. — Montana wildlife officials indefinitely closed a 183-mile stretch of the Yellowstone River and hundreds of miles of other waterways Friday, barring all fishing, rafting and other activities to prevent the spread of a parasite believed to have killed tens of thousands of fish. Fishing guides and rafting operators who run businesses along the river said the move could be catastrophic to the area's sizable outdoor industry, which depends heavily on the busy summer season. The closure could last for months if river conditions don't improve and fish keep dying, according to officials from Montana Fish, Wildlife and Parks. It extends to hundreds of miles of waterways that feed into the Yellowstone, including the Boulder, Shields and Stillwater rivers. Even when the river reopens, there are fears the fish die-off could deal a lasting blow to the Yellowstone's reputation as a world-class trout fishery that draws visitors from around the world. "This kill is unprecedented in magnitude. We haven't seen something like this in Montana," Fish, Wildlife and Parks spokeswoman Andrea Jones said. By Friday, roughly 4,000 dead fish had been counted, but the total number is estimated to be in the tens of thousands, including fish that sank to the bottom, officials said. Most have been mountain whitefish, a native game species, but reports emerged that the die-off has affected some rainbow trout and Yellowstone cutthroat trout — species crucial to the fishing industry. No dead fish were found inside Yellowstone National Park, where a celebration of the National Park Service's 100th anniversary is set for next week. Officials said they had no plans to close waters inside the park. The closure on the Montana portion of the river aims to stop the spread of the parasite, which causes fish to contract a fatal kidney disease, as well as protect the fishery and the outdoor economy it sustains, officials said. The disease was previously documented just twice in the state over the past 20 years but more recent outbreaks have occurred in Washington, Oregon and Idaho. Officials said it does not pose a health risk to people. Low water levels and warm temperatures are making the problem worse by adding to the stresses faced by cold-water species such as trout and whitefish, officials said. In other rivers, outbreaks of the disease persisted until water temperatures dropped months later. On the Yellowstone, fishing, wading, floating, boating and other activities are banned until further notice. Numerous fly fishing outfitters and rafting companies operate in the closed stretch of river, which extends from Yellowstone National Park's northern boundary to the city of Laurel, along with all tributaries in those areas. Fishing guide Dan Gigone, who owns the Sweetwater Fly Shop in Livingston, said one of his guides reported seeing hundreds of dead fish, including some trout, in the river Thursday. Gigone called the closure catastrophic but said he would not fight it. Yellowstone Raft Co. owner Robin Trotter said she had started calling hundreds of customers with reservations in coming weeks to let them know their trips could be canceled. Fish, Wildlife and Parks Director Jeff Hagener said the agency had to balance economic consequences with the risk to the fishery, given that recreational activities disturb fish and exacerbate the effects of the disease. The parasite is not native to the area, meaning it was introduced by people via a contaminated boat, fishing waders or other means — or possibly by birds that transported it from another waterway, officials said. The wildlife agency set up two decontamination stations to try to reduce the chance of equipment spreading the parasite to other rivers. The agency urged the public to clean equipment properly before moving between bodies of water. 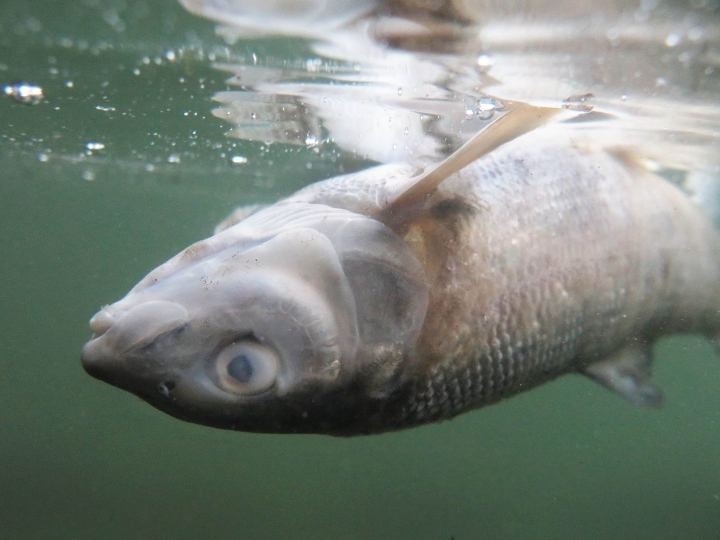 "There's not a lot known about how this moves through the environment," said Dan Garren of Idaho Fish and Game who dealt with a 2012 whitefish die-off blamed on the parasite. "It's easy to overlook a dead whitefish. It's true for biologists, it's true for anglers. They don't carry the same weight as trout." This story has been corrected to show that closure area includes 183 miles of the Yellowstone River, not 175.